So, there we go. With the arrest of three cricketers belonging to the Rajasthan Royals team in the IPL, for the crime of spot-fixing, widespread and long time speculations of corruption in the cash rich league have been confirmed. 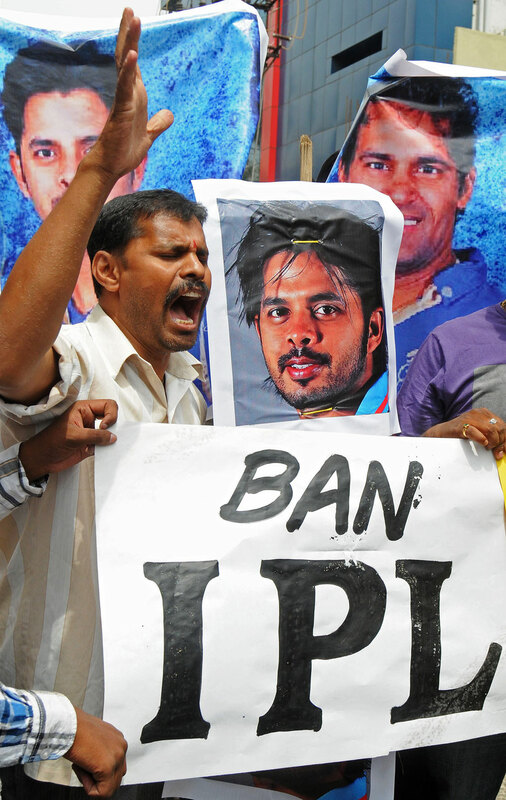 S Sreesanth, Ajit Chandila and Ankeet Chavan – all bowlers – were allegedly promised money ranging from US$ 36,000 to 109, 000 for conceding a specific number of runs in a particular over in three separate games. These cricketers have been charged with fraud, cheating and criminal conspiracy – a shameful list of wrongdoings which is the antithesis of sports. If proven guilty, these players are staring at the end of their careers, a considerable amount of time in prison and a lifetime of regret and guilt. The first thought that came to my mind when I heard of the news was, “How can these guys be so stupid?”. In the last few years, spot-fixing has been firmly thrust in the spotlight; Amir and Asif during a Lord’s Test, Kaneria and Westfield in county cricket, uncapped IPL players attempting it in the Indian domestic circuit. All these players got caught and were handed appropriate punishments. The ICC and the respective national boards have revamped their anti-corruption units in recent times, while there has been an increase in efforts to better educate the players as to what to do when they are approached by bookies and which authorities to contact when it happens. Spot-fixing has been pretty much publicized and recognized as a new scourge of cricket all over the world, and yet three well paid cricketers, one a Test player, have likely sacrificed promising careers in the pursuit of “just a little more $”. Sure, there will be a bunch of detractors gunning for the tournament. Any league which throws around the amount of cash it does will always be a ripe target for bookies. Added to it, is the lopsided difference in salaries between team-mates at a particular franchise; a seasoned player getting much less than a supposed T20 specialist is as susceptible to approaches by undesirable elements as an uncapped rookie who earns barely a fraction of the highest paid players in his team. These and other points by IPL detractors are pertinent and not to be ignored. At the same time, these should not distract from the core issue – the susceptibility of these players who fall prey to greed. Spot fixing or match fixing is not just confined to the IPL; in fact, it is not even confined to the game of cricket. It permeates just about every major sports in the world to varying degrees. One can’t wash his hands off watching sports altogether, just for that. The problem is not a specific format or a tournament; the problem is the man who is willing to compromise his morals, ethics and integrity to satisfy his greed and in the process, deceives his team-mates, fans, coaches, family and himself. And its not a problem that is going to go away easily. The game of cricket is lucky to have some extraordinary players who entertain with their talent, inspire with their courage and make us loyal fans with their commitment. In a nutshell, that is the essence of sports. A few bad eggs (a term which is all the rage right now!) should not shake our faith in the game or its players. You can form all the anti-corruption units in the world, educate the players every day about the scourge of fixing, provide better salaries – but there will always be a few for whom greed pervades over all other factors. So, much like the War on Terror, the fight against corruption in sports will have to be an ongoing exercise; there will be setbacks along the way but it must never end. More importantly, never let a select few sully your love of the game.